I wanted to get in one last Halloween craft for 2013... and I made it just under the wire. 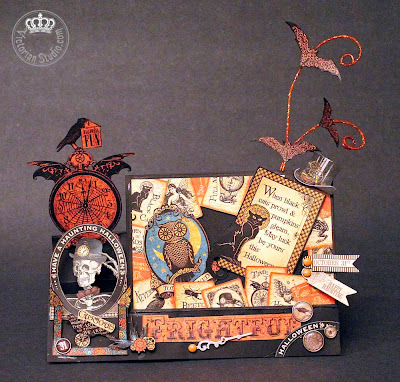 After watching Anne of Anne's Paper Creations videos using Graphic 45's "Steampunk Spells" paper to make incredible books, it got me itching to try some of her techniques. 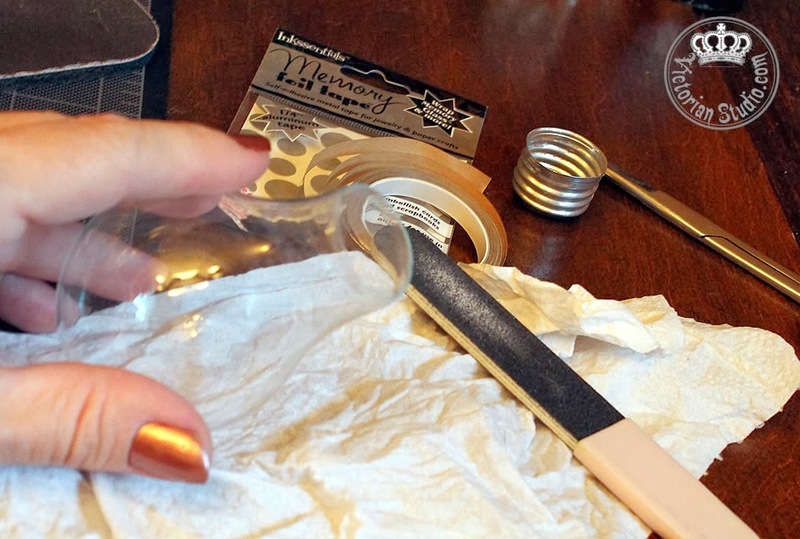 I still had some of this very same paper; leftover from my Apothecary Cabinet project, so out came my scissors to try my hand at "fussy cutting". Yep. "Fussy Cutting". I used to just call it cut outs, but when Anne says it with her Norwegian accent.... well, it's just too charming and my favorite current saying. I cut out, er, sorry "fussy cut" all sorts of pieces from the 12 x 12 papers, used my Copic brush pen to outline them in black, and then slathered Multi-Medium Matte on the front and back of each piece. This makes them more durable, as some would be removable, tucked into other parts. This is actually a table topper tent card - I just wanted something to decorate our dining room table. 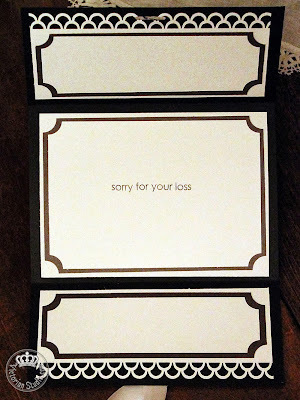 I started out by creating a side step card with black cardstock and added my "fussy cuts". 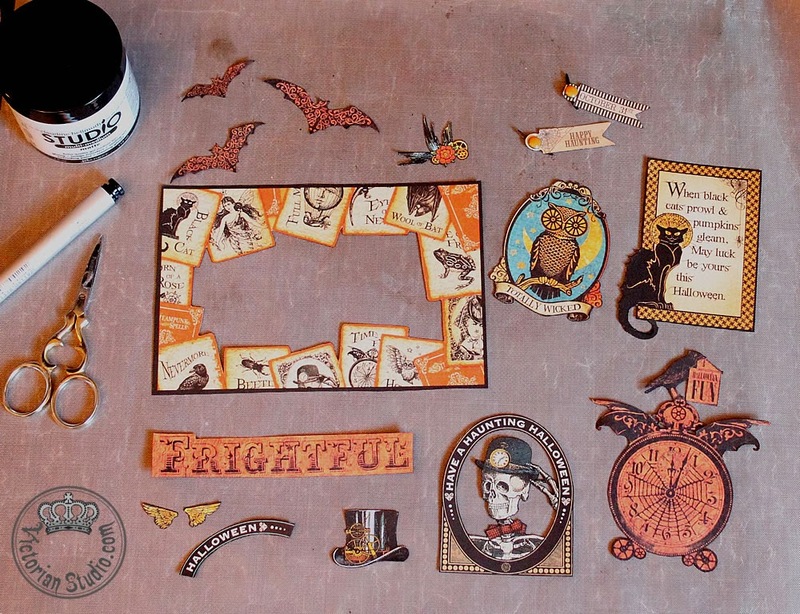 Three bats were added to glittery and alcohol-inked wires, a few brads and a clock hand were also attached to the front. As I said, some of the pieces slide in; the two cards on the main section are removable. Some pieces, like the top hat and flowers are popped up with foam dimensionals. Thank you so much Anne, for the tutorials and wonderful inspiration. It's been a busy month; after working on my recent large projects, it was time to get back to some card-making. My parents celebrated their 65th wedding anniversary yesterday so I made this card for them. I started out with a regular white cardstock base and added quite a few layers. 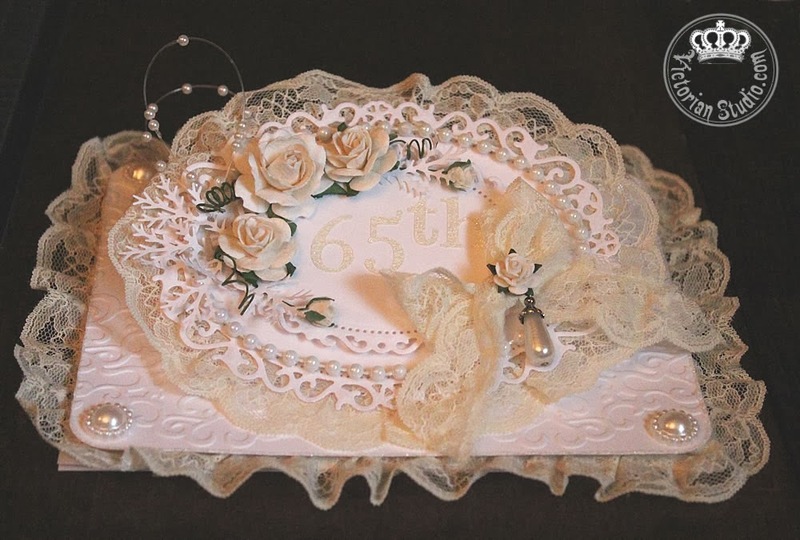 The first (lowest) is composed of an embossed white card with ivory lace attached to the back and pearly embellishments on the rounded corners. I added Frosted Lace Stickles to the edge and popped it up on a regular folded card with a solid base of foam core. Here's a side view. 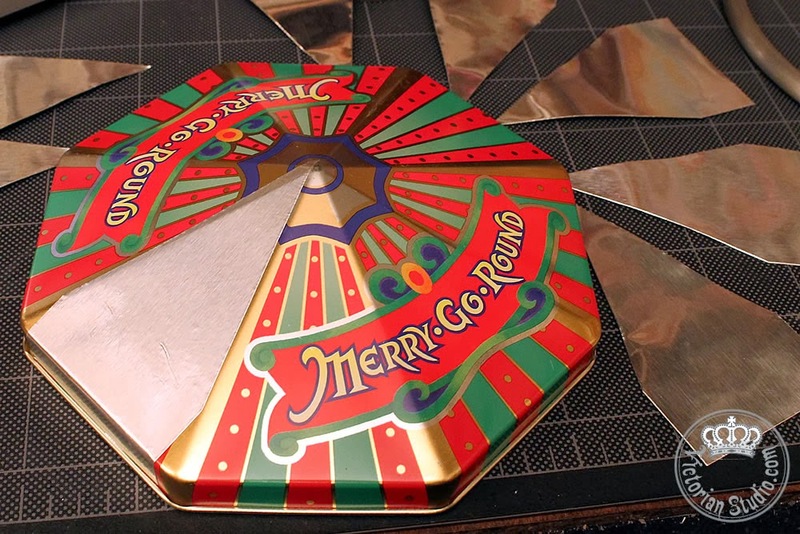 The next layer is a set three large Spellbinder oval dies. 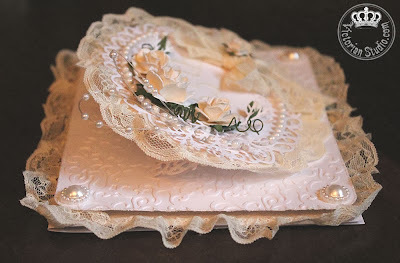 Two sandwich more ivory lace and are propped up on an angle with the third oval folded underneath and secured to the embossed layer. I also attached the front of this layer to the card with Scor-Tape. I added a ring of pearls around the edge of these die cuts. The third and upper-most layer is a smaller oval Spellbinder die popped up with foam dimensionals. 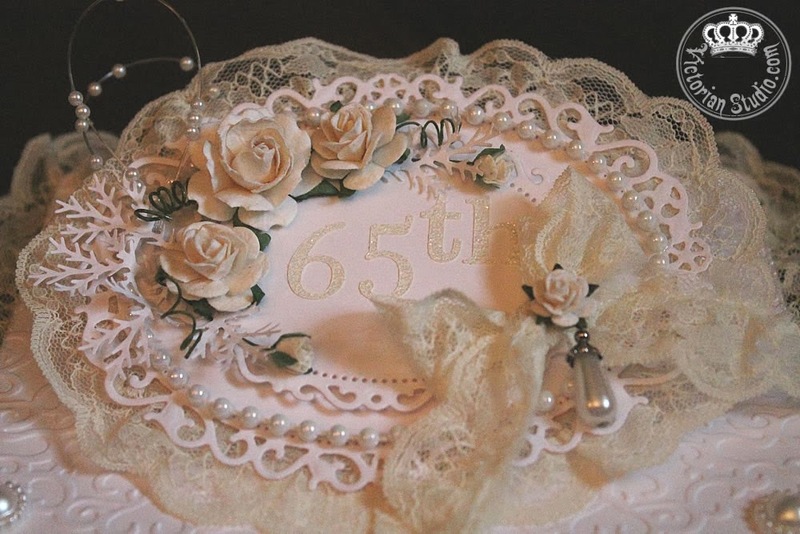 To this layer I added white glittery Thickers numbers and letters, White Orchid Crafts roses, Michael's brand wedding pearl spray, Martha Stewart punched leaves, lace bow and a drop pearl from my jewelry stash. Good thing this was a hand-delivered card; it would never fit into an envelope! Happy Anniversary Mom and Dad!!! Love you so much! 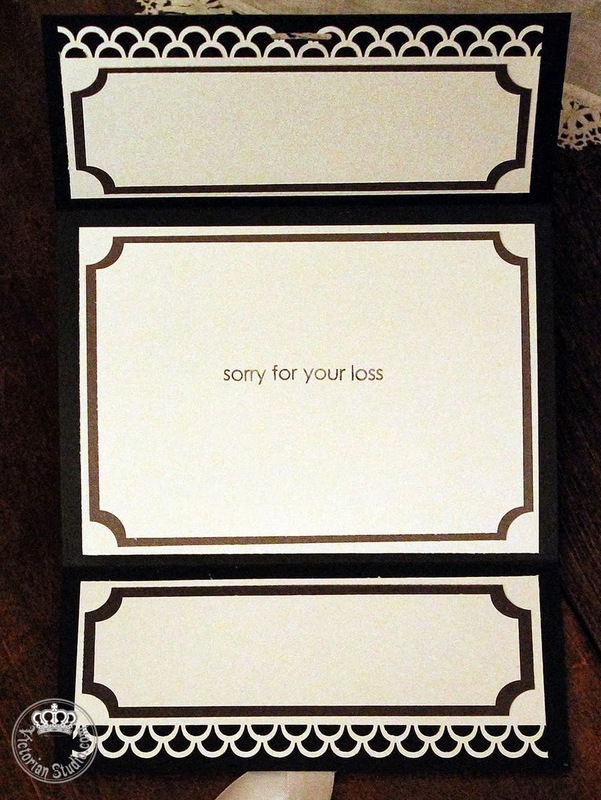 Next up, I was asked to create a card for a co-worker who recently lost her mother. 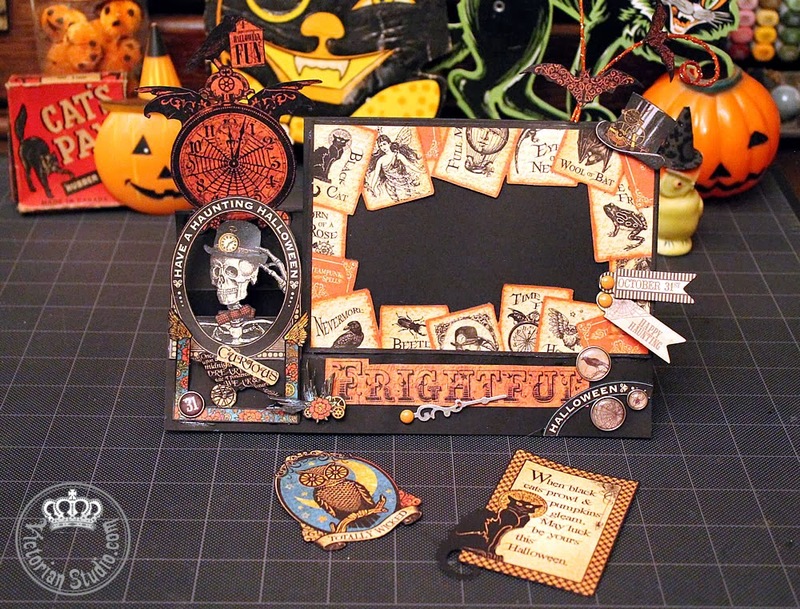 I tried something different and made a triple-fold out card in landscape from black cardstock. 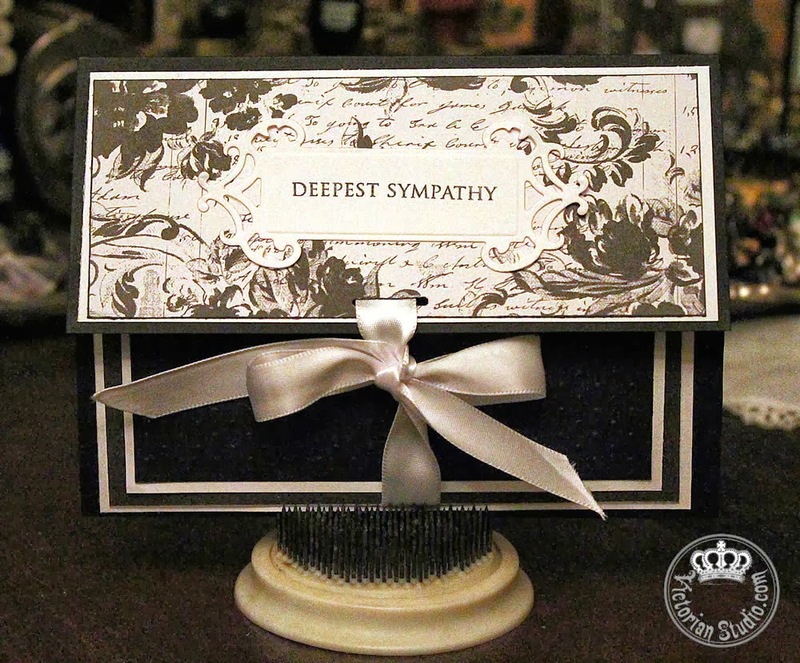 I added some beautiful black and white patterned paper to the top fold and embossed and multi-layered the bottom panel overtop a white ribbon. A Spellbinders die and Hero Arts stamp was added to the top panel. 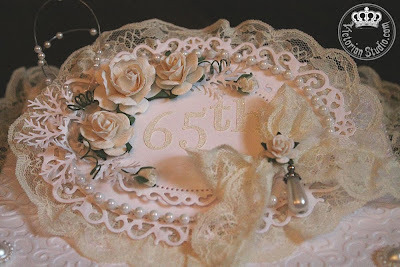 I used my Stampin Up slot punch to feed the ribbon through the top, tying a bow to close. Since the cardstock base was black, I added three panels for co-workers' signatures. Using a Martha Stewart edge punch on the top and bottom panels, I layered each section three deep, cutting out the corners with a small circle punch. It was great to get back to some card making! 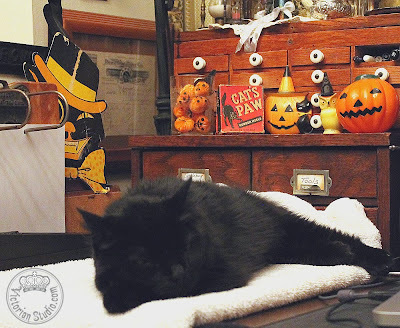 Every day in my Studio is a pleasure and I am never alone as Dakotah my black cat always joins me while I work. Trying to be as close as possible, she is often found sleeping up on my desk rather than in the basket on the floor. I folded up a towel to make her spot more comfy, so it didn't take long for Sheba our grey tabby to park herself up there too. 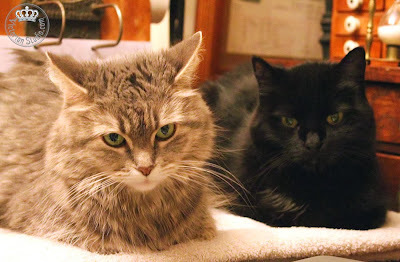 I was surprised Dakotah put up with this intrusion - they snoozed peacefully whilst I cut, taped, glued and stamped. 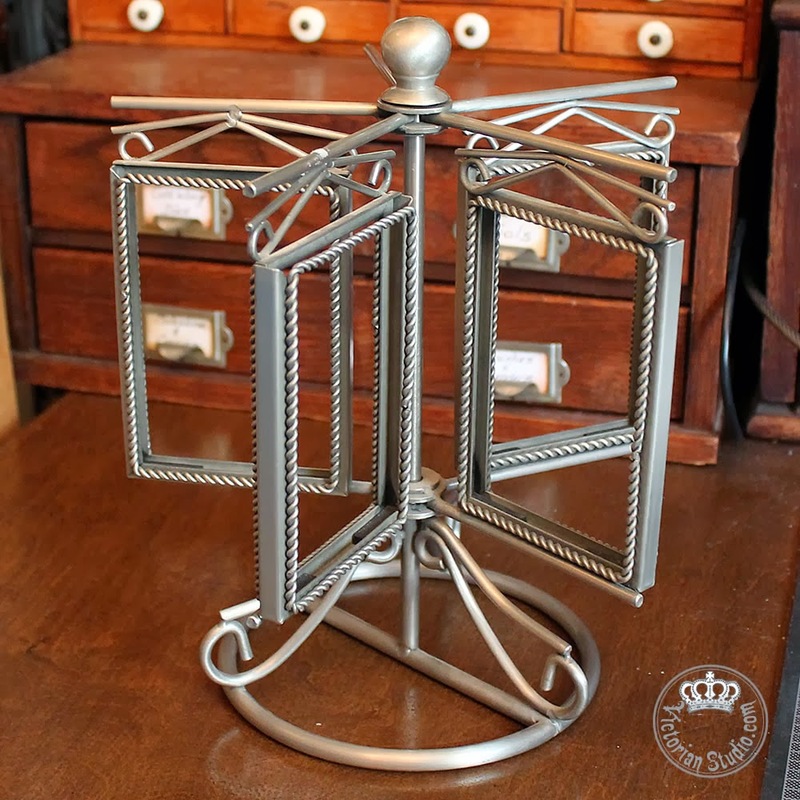 I thought that if I could only get those frames off without damaging it too much, this spinning photo frame display would be the perfect start to my carousel. So I slapped down a whole $3 and took a chance. Much to my delight, the frames actually snapped right off when I bent them back and forth a few times - awesome! Without the frames to hold them apart, both sets of five spokes slid down on top of each other. I asked hubby to do his magic, and he was able to saw the top knob off perfectly (I had hoped it was just screwed on, but no such luck). 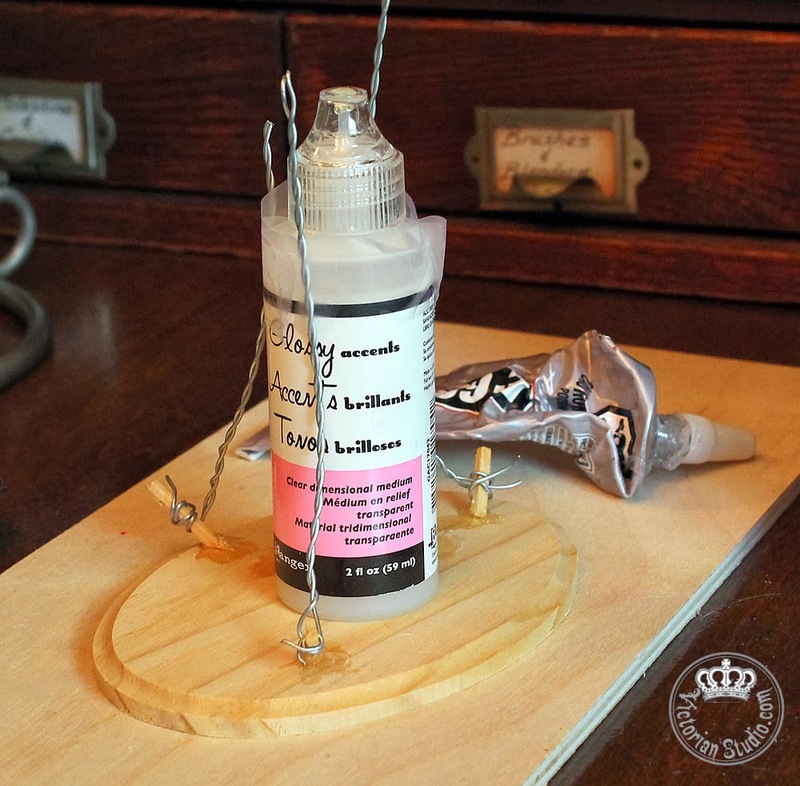 I slid the spokes off, glued a stopper near the top of the central post, glued both sets of spokes together and viola, they spun in unison - 10 spokes ready for swings! Goodwill came through again when I picked up this M&M's candy tin for a whole 50 cents. 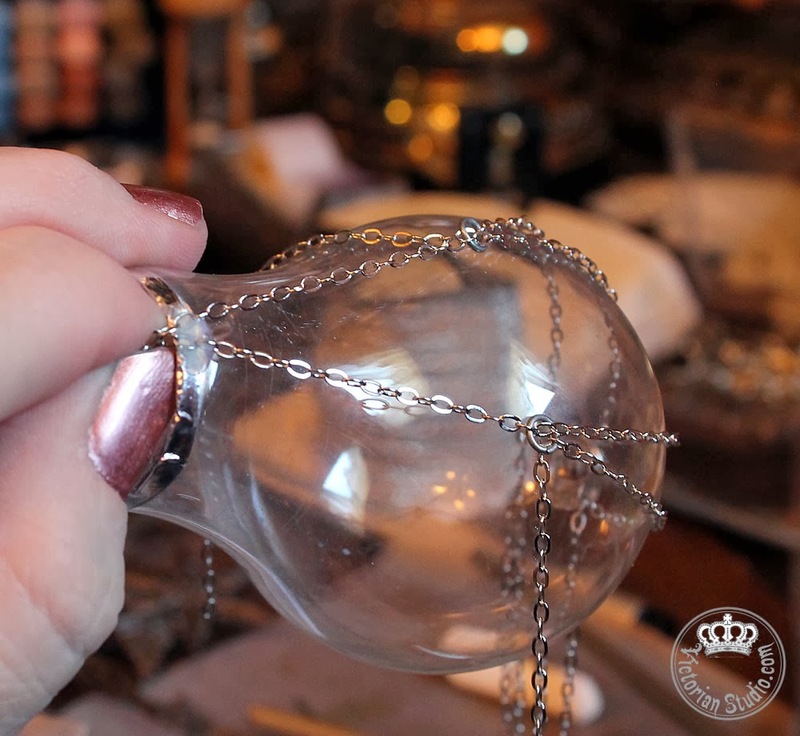 The perfect shape, I simply used my silver tape to cover the top. Silver brads were cut down and glued to represent rivets. Some glittered swirl brads were also added to decorate the top. 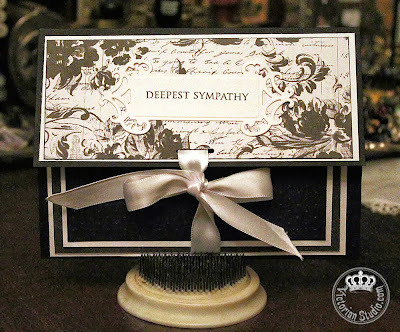 The decorative black edge was created from cardstock using a Martha Stewart punch. Silver brads and chain finished it off. 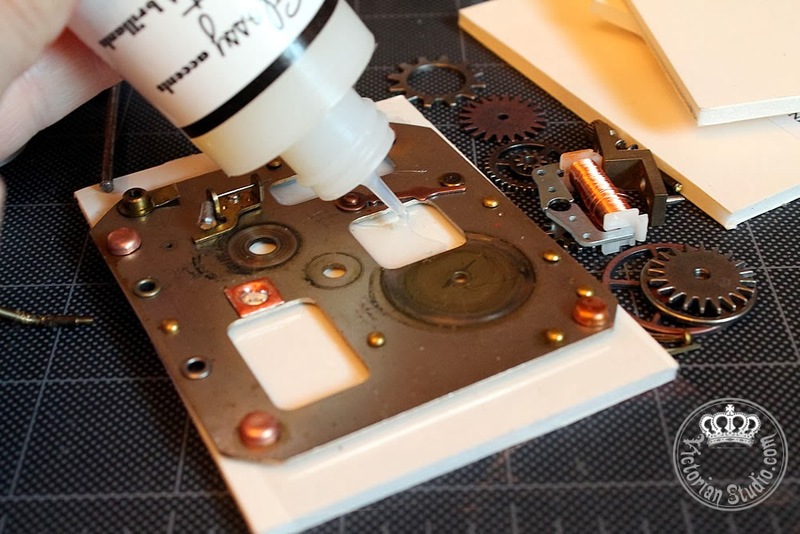 I glued a clock gear under the knob and attached it to the top with E6000 glue. On the underside of this part, I glued a large nut so when it was placed over the center pole, it rotates independent of the spokes. Making the swings was purely a hit-and-miss adventure... I thought I could fit 10 swings in, one on each spoke. So what did I do? Yep. I made ten seats. I punched out twenty "arms" (again, a Martha Stewart punch, folded in half to double it up). I counted out 80 rivets - 8 per seat to secure the chains. I designed the seats and cut out 10 of each, scoring and punching the backs for a decorative touch. 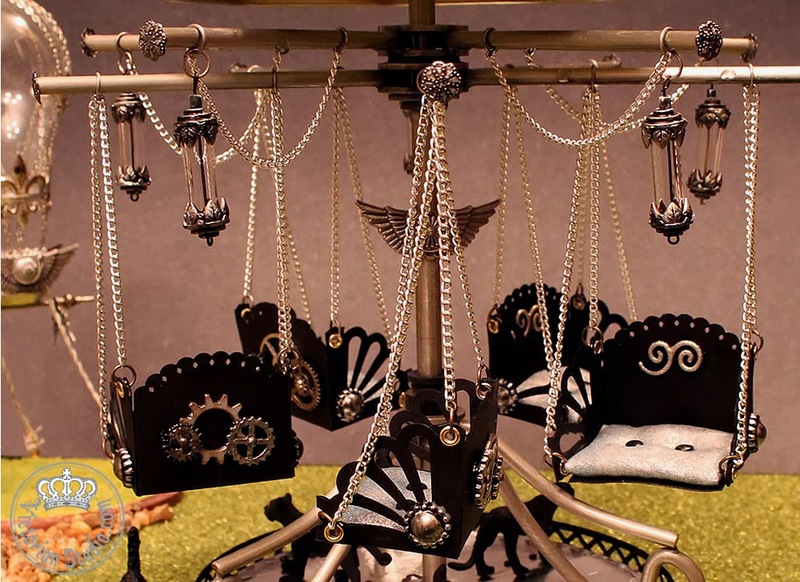 I counted out 60 jump rings to attach the chains to the chairs and the spokes. 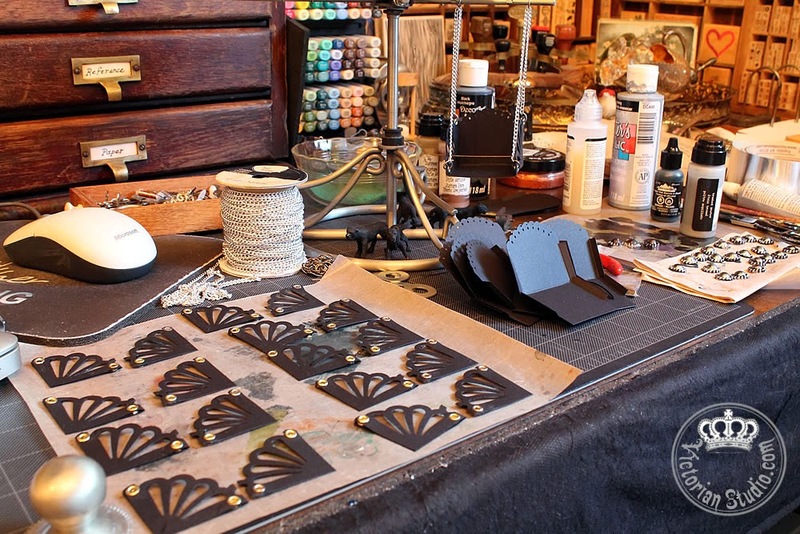 A production line was created at every step... brads were painted and inked. 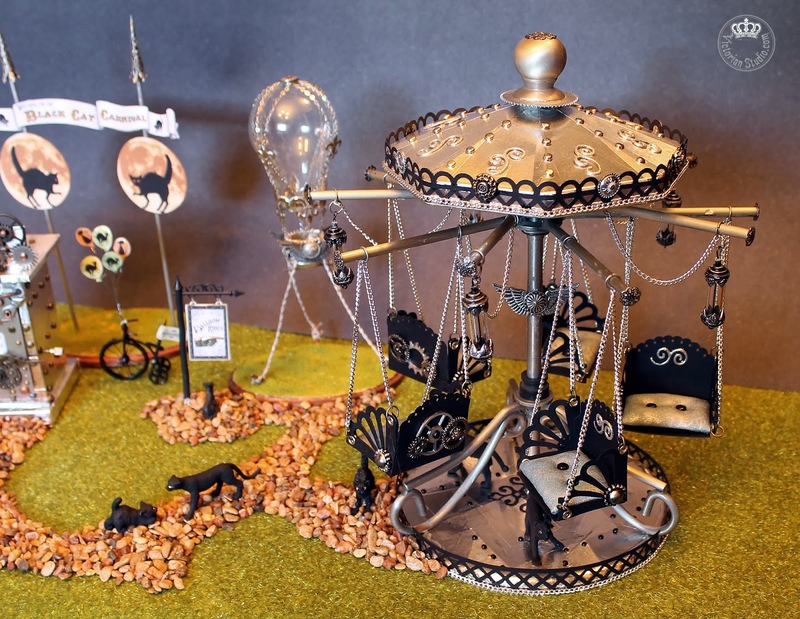 Thirty gears were chosen to decorate the back of each swing and some needed to be painted and inked in black and silver. Pieces were lined up for assembly. I even made ten padded seats for each one... a piece of cardboard covered with fiberfill and cloth, glued together and two brads poked through for an upholstered look. It was way too cramped and I could only use half of them! Aw Crap! 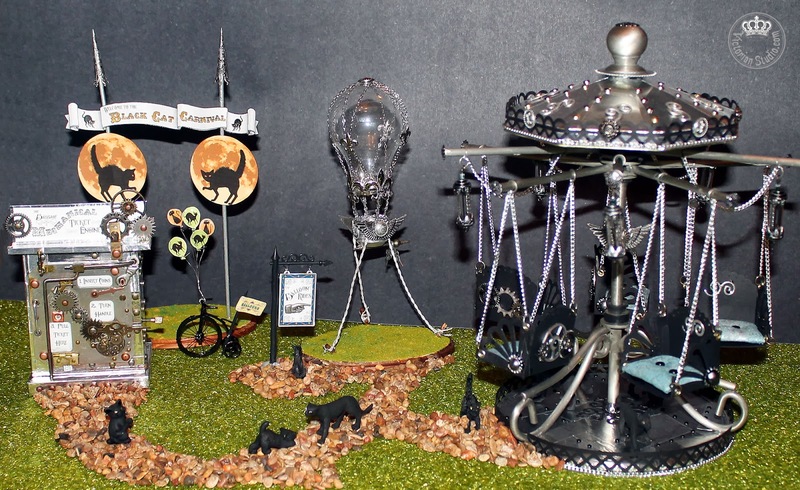 Oh well, I placed the swings on every other spoke and added some lanterns onto the others. Filigreed bead caps were glued to the spoke ends to finish them off. Then I had to decide what the heck to do with the base. 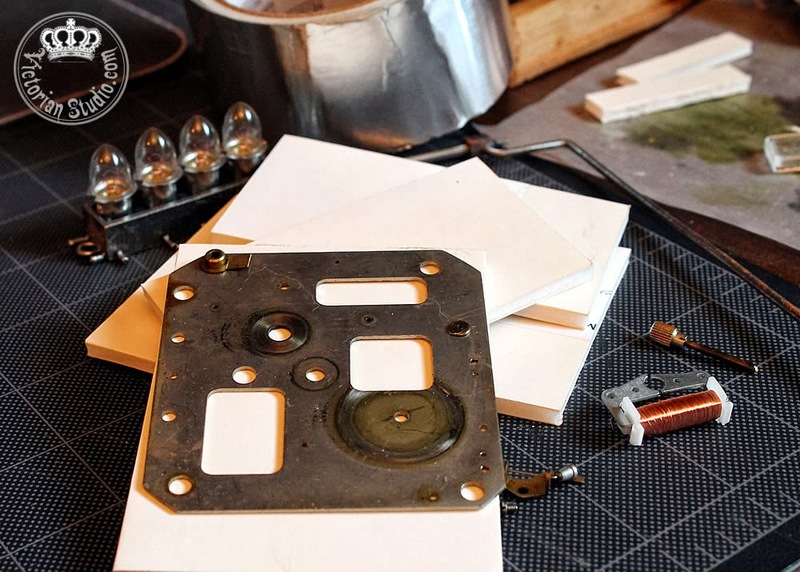 I had visions of either covering the three "legs" with cloth, or cardboard... but then I simply cut two pieces of chipboard in half circles, covered them with the silver foil tape, used my piercing tool to create pilot holes and inserted black brads for rivets. I used my Cuttlebug and Spellbinders die to create the center design around the pole. I also used the bottom half of the black cardstock decor I placed on the top for a fence of sorts around the base. I also finished off the edge of the base with more silver chain, just like the top. Three black cats (okay they weren't black before I painted them and added Gold Stickles for eyes that glow when photographed) stand guard on the base. 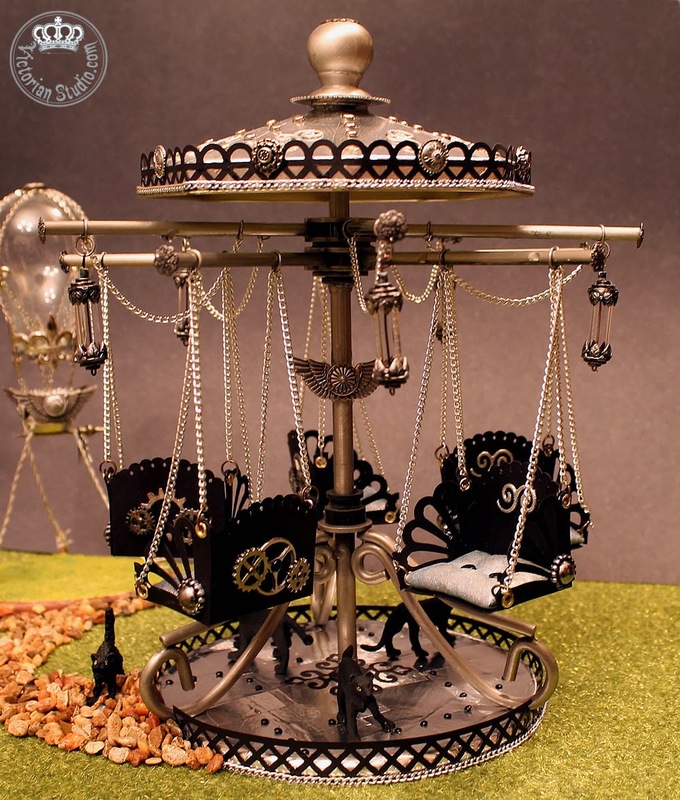 Oh and I added a pair of wings to the center pole too... matching it up with the Steampunk Airship. That was a fun transformation! So I guess that's it for now... until I figure out what to add next. 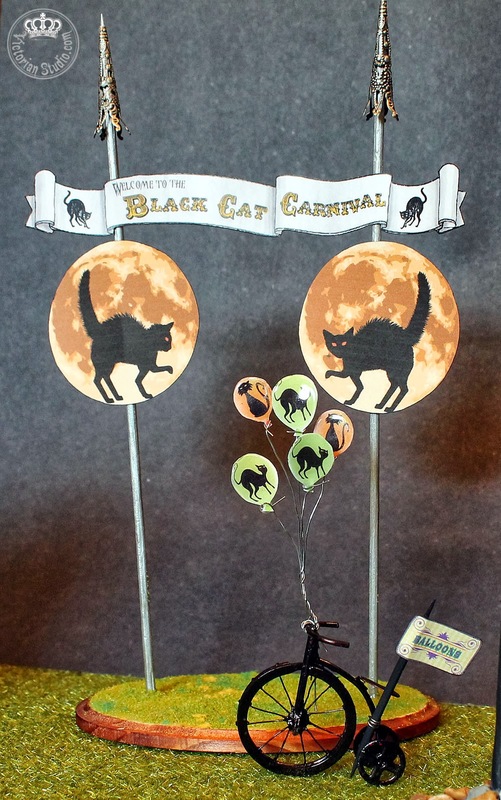 Previously I wrote about creating my Black Cat Carnival inspired by Laura Carson's Halloween Event. 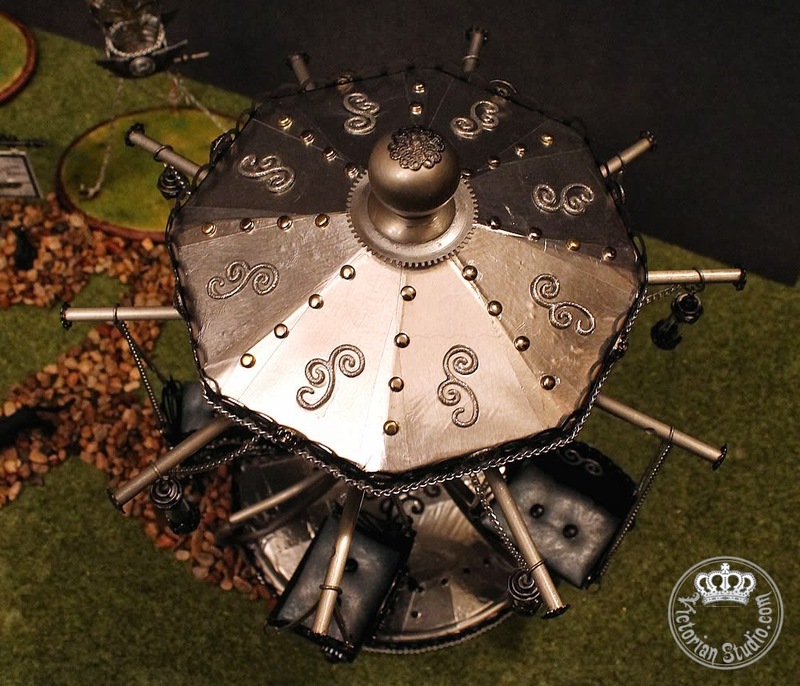 You can find my first post about my project HERE where I described how I made my Steampunk Airship. 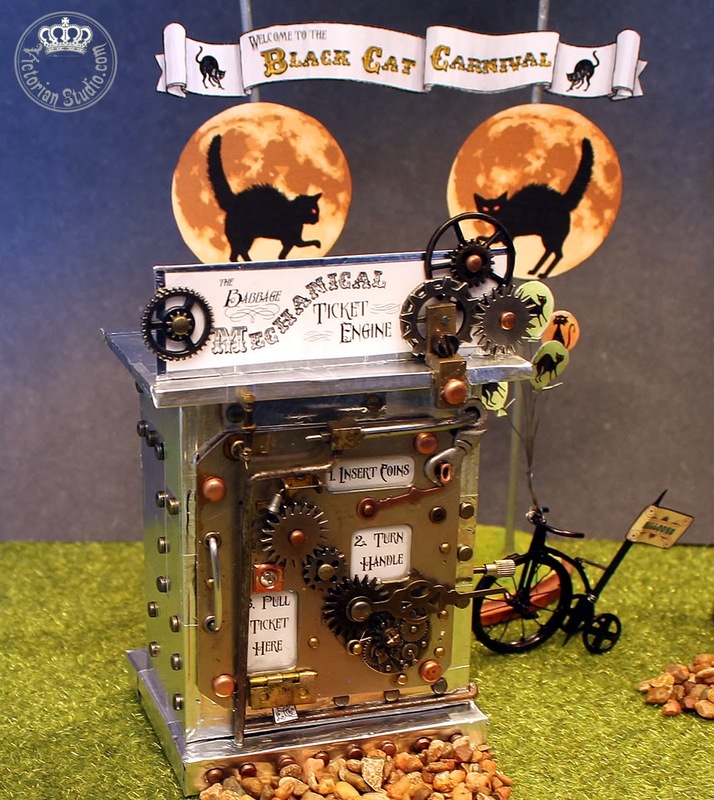 Today I'll give you a bit more information on how I made the Carnival Entrance and Ticket Machine. I wanted to display a banner of the name of my Carnival, so I painted two wooden skewers silver and used E6000 glue to attach them on a wooden stand. Two silver bead caps were slid on top of each and I printed out my banner with two of Laura's scaredy cats on each side. I coloured it in with Copics. Underneath the banner I wanted to add two more of Laura's images; her black cats and moons were perfect for my theme! I also used her cat balloon images, printed them out and added Glossy Accents to make each one shiny. I wrapped wire around each and tied the bundle to the handles of the bike. 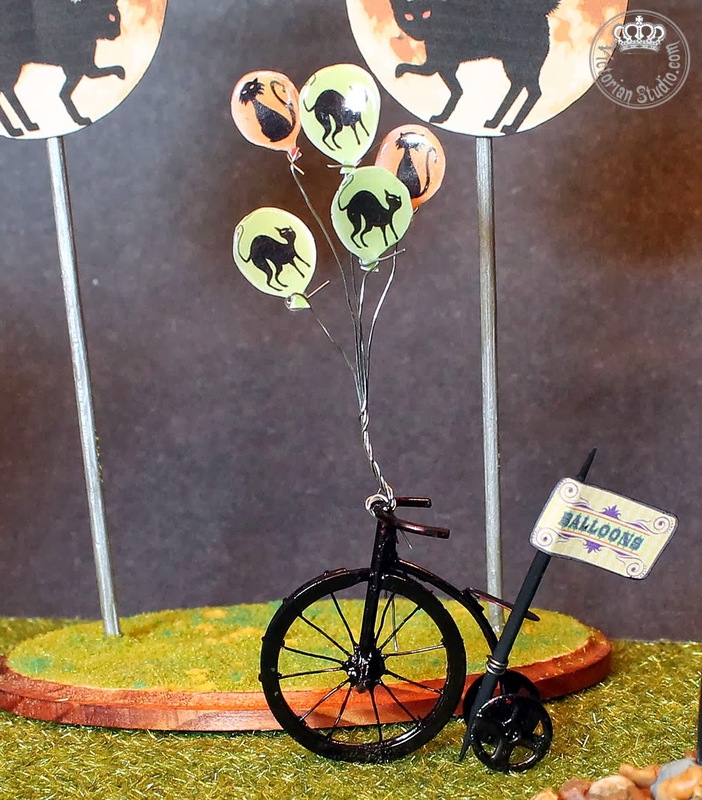 The "Balloons" sign is also hers; I simply attached it to a black-inked toothpick and wired it to the bike too. The Penny-Farthing was made from a tiny red bicycle ornament I found at Michael's (yep, in the Christmas section!). It had a regular sized front wheel, so I snipped it off and inserted a metal key ring I had in my stash - first wrapping it with wire for the spokes. Again, E6000 glue came to the rescue to attach the new wheel, after which the whole thing was coloured black with some alcohol ink. 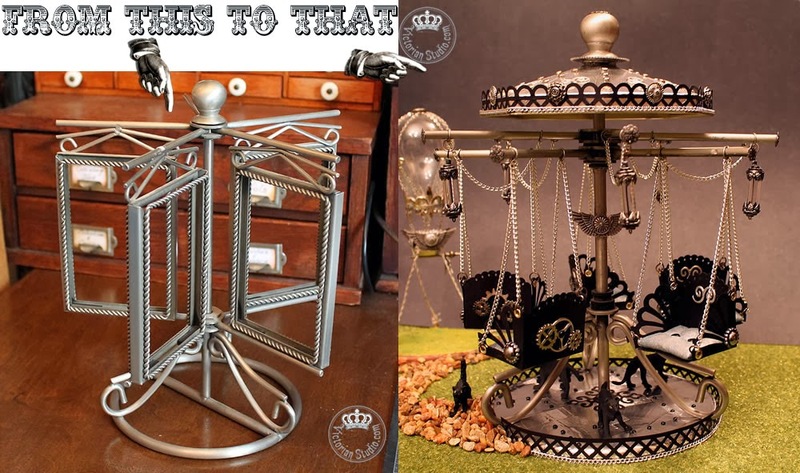 I really went to town to try to create a Steampunk style ticket machine... Steampunk is all about the gears, pipes, metal rivets and mechanical devices that still retain a Victorian look. In the early 1800s, Charles Babbage (the father of the modern-day computer) designed the first computing machine, which is why I named mine "The Babbage Mechanical Ticket Machine". 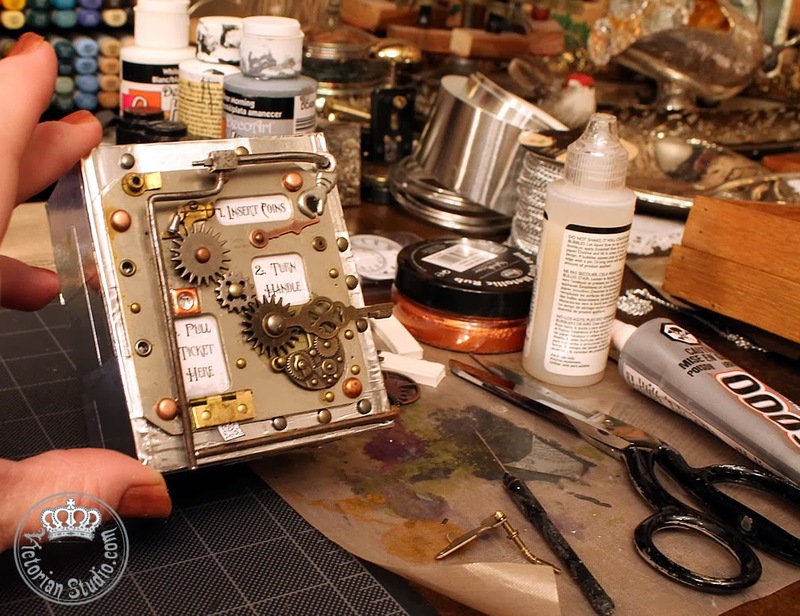 I started off by pulling out a vintage metal clock piece I've had since I made my Steampunk sculpture last year. I liked the fact it had three "windows" and lots of places for rivets and gears... so this became the front of my machine. I realize it's not in scale with my Steampunk Airship, but that would have been way too tiny to create all the details I wanted. I cut seven pieces of white foamboard; four for the walls, a base, a roof and a small part for the sign on top. I slid a piece of clear plastic underneath the faceplate and poured Glossy Accents into each window, and set it aside to dry. Now I could place instructions behind each opening, so I printed off three steps a Carnival-goer would need to perform to retrieve their ride ticket and taped them to the back. I used good old E6000 again (notice the new tube... um, yeah) to attach brads to gears, gears to the faceplate along with steam tubes, rivets and watch parts. After building the box from foam core, I cut different sized squares of metallic adhesive tape and layered the entire box in silver. Then I attached the faceplate and inserted the handle on the side. I added rivets to the box by first poking a needle through and then inserted metallic brads into the pilot holes - easy! The roof and base were added last, with more gears and metal bits decorating the machine's sign. 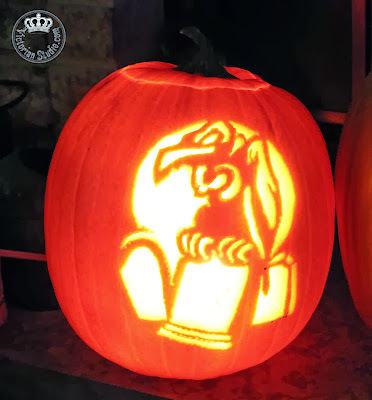 Okay, I must confess this took awhile to make; each night after work I did a bit so it could dry between steps - but it was totally fun to do! Up next: The Carousel that used to be a photo holder. Honest. I knew after watching Laura Carson's Halloween Carnival videos, that I wanted to make something similar and participate in her Event Challenge and Giveaway. If you haven't read her post, I would highly recommend you visiting to see all her wonderful creations. Weeks ago I started thinking about what my Halloween Carnival theme would be. As I am surrounded by all things Victorian and rusty industrial goodness, it should come as no surprise that I love Steampunk. Yep... 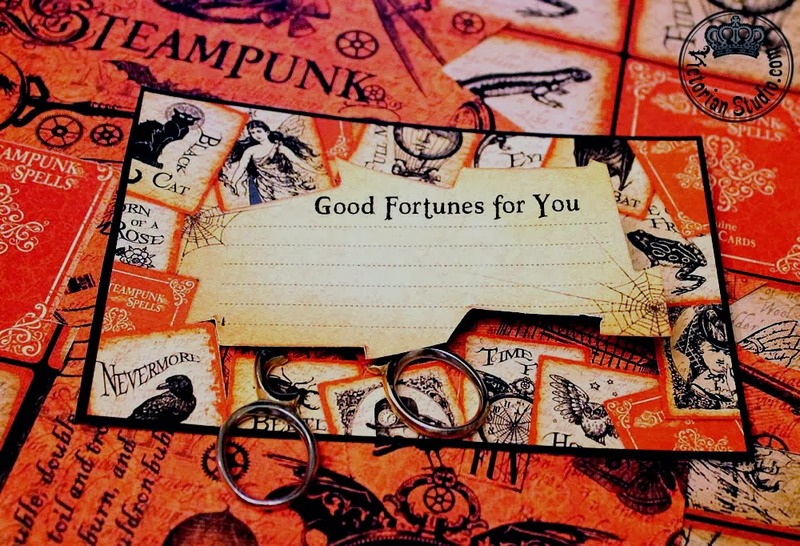 I so enjoy movies like Hugo, Around The World In 80 Days, The Time Machine, Sherlock Holmes (um, RDJr... hello! ), Sky Captain and Lemony Snicket to name a few. 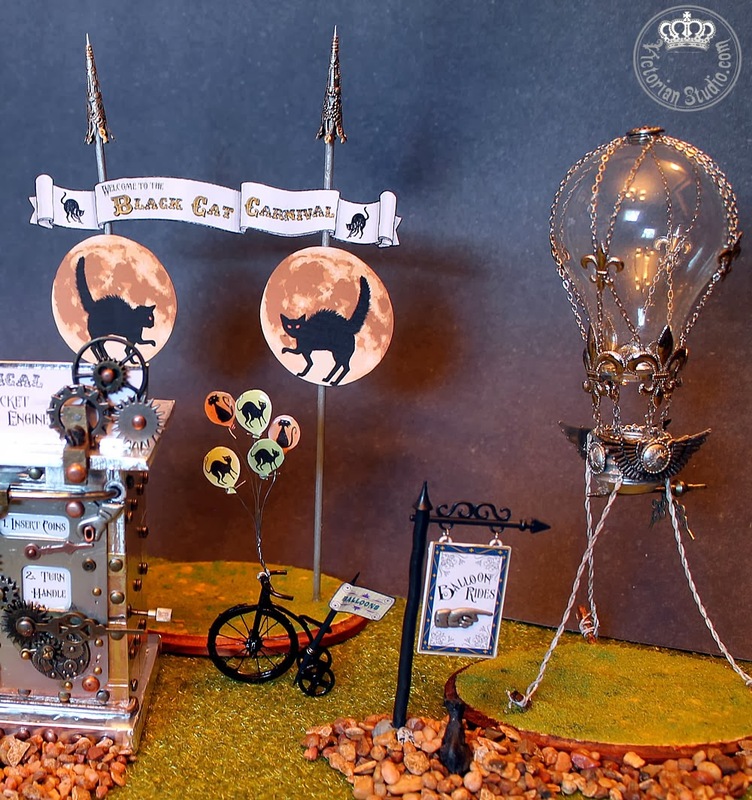 So the idea of a Steampunk-themed carnival was born - but to link it to Halloween, it would also be a Black Cat Carnival. 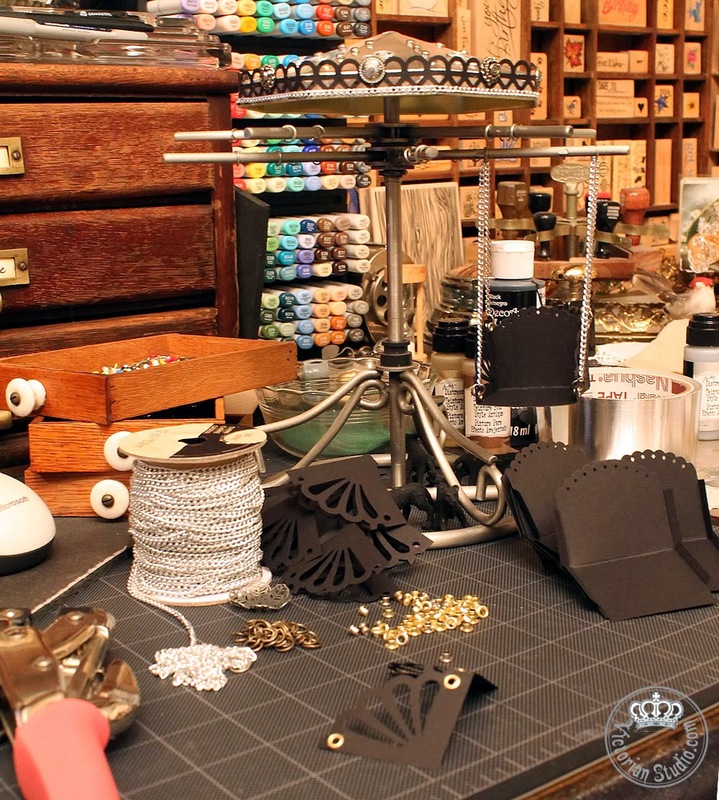 So I began pulling together all kinds of gears, wire, gadgets and tiny metallic thingamabobs that I could use. A few trips to Goodwill, Michael's and even Home Depot helped supply and inspire. Here's a shot of my carnival so far; it includes a welcome banner entrance with balloon sales on a penny-farthing bicycle, a hot air steamship, a mechanical ticket dispenser and a swing ride carousel ride. The great thing about this project is that I know I will be adding to it this year and I can continue to expand on it year after year. 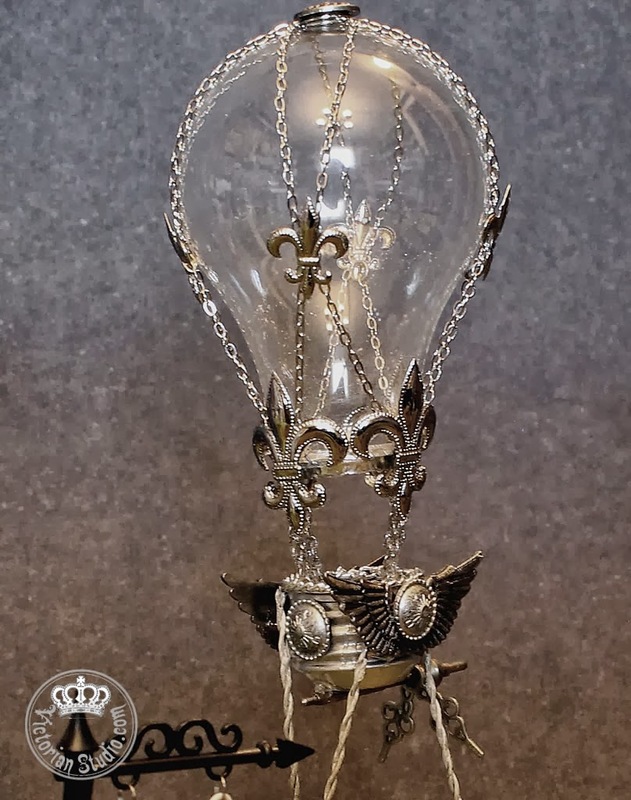 The first item I made was the hot air balloon ride - a Steampunk Airship made from a light bulb. 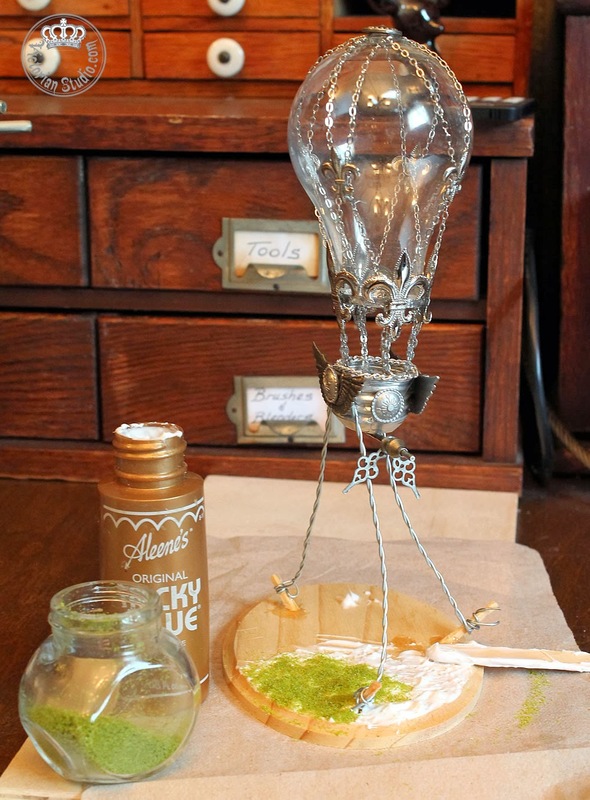 I have JoJo to thank for bringing this idea to my attention - she made a wonderful light bulb craft a few weeks back. Now I have never, ever taken apart a bulb before, so off I went to YouTube to learn the tricks. It was easier than I thought! In mere minutes, I dissected two light bulbs without any bloodshed - yes, two; in case I damaged one. 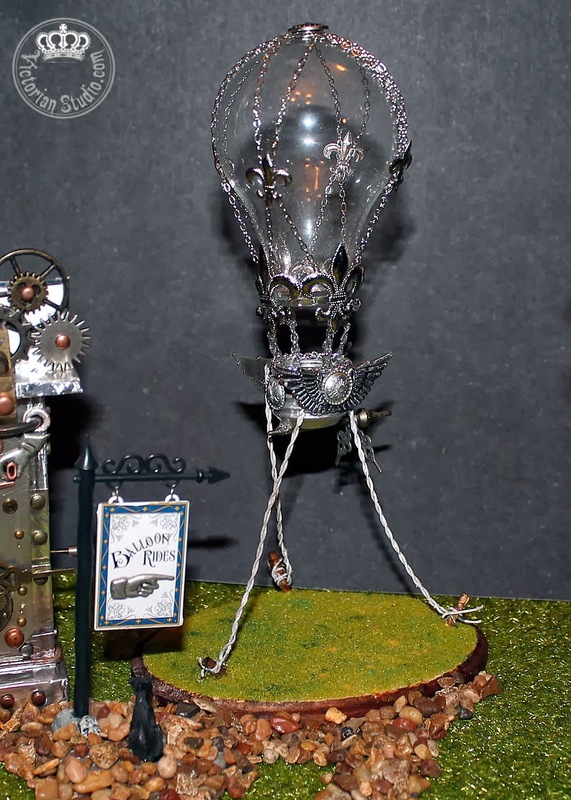 I sanded down any sharp edges and kept the metal base of the bulb for the airship's "basket". 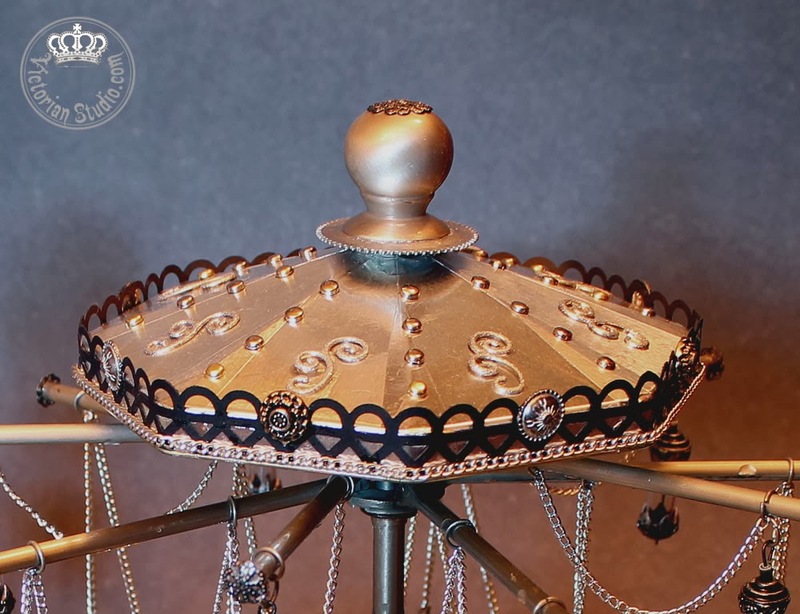 Since it was Steampunk, I used chain, silver brads and metallic tape to decorate. E6000 glue was great to attach the chain and brads to the glass. It also held the stakes in the base so the airship would "float" above ground "held down" by its restraining ropes. Aleene's Tacky glue attached sage, green and yellow Flowersoft for a grassy effect. The chain attaching the balloon to the basket was kept stiff with a good slathering of E6000; otherwise it wouldn't "float" like I wanted. 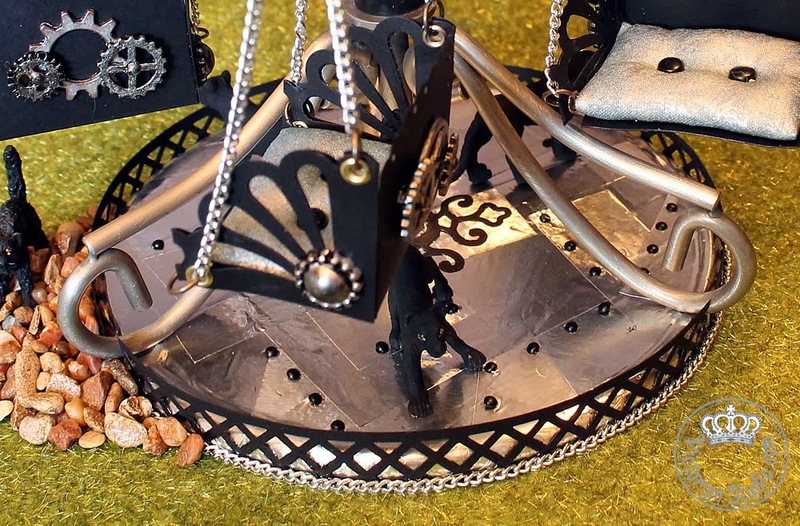 A few metal clock bits made a funky prop and brads with metal wings were added for decoration. The "ropes" holding the balloon down were painted white and the wood coloured with Copics. 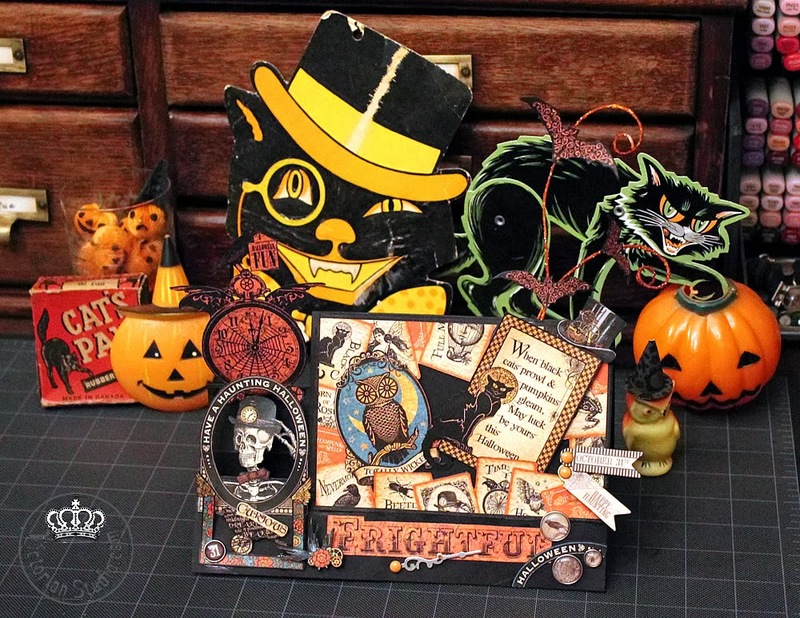 I covered the Lemax Halloween guidepost and black cat with my own sign and a pointing hand brad. Up next: how I made the Ticket Machine, Balloon Bike and Entrance. Also sharing with Tee's Halloween Linky Party!